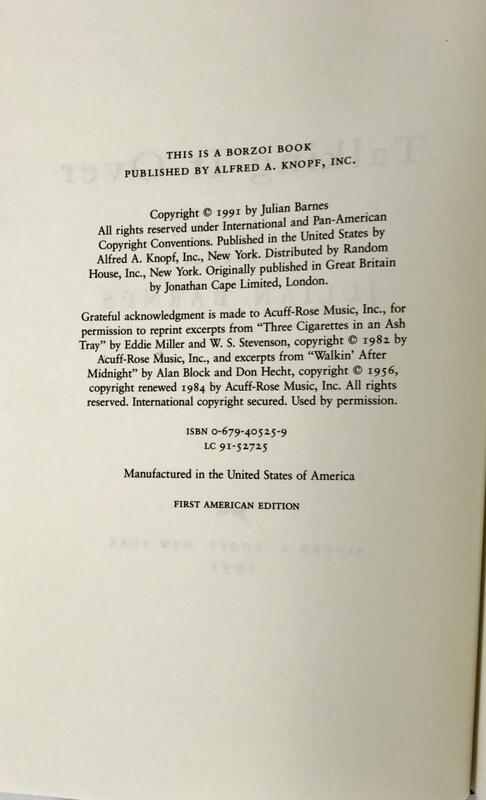 Notes on this edition: First American edition – New York: Alfred A. Knopf, 1991. 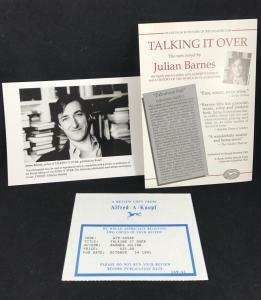 $21.00. 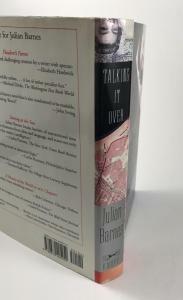 The American edition features an uncut fore edge, while the nearly identical first Canadian edition has a cut fore edge. Pictured in this entry are three title pages — one unsigned, one signed, and one inscribed from Barnes to Christopher Buckley during a visit to Christopher Hitchens’s home in Washington D.C.: “to Christopher B. | from | Julian B. | Chez the Hitch | October 1991”. Also photographed is a collection of promotional inserts that accompanied hardback review copies of the novel distributed to reviewers. Collation: 21.2 x 14.3 cm. 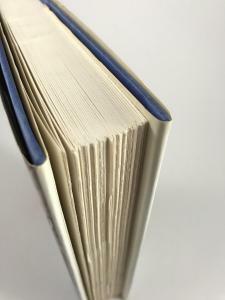 Untrimmed pages. Pp. [i-x, 1-4] 5-47 [48-52] 53-67 [68-70] 71-81 [82-84] 85-95 [96-98] 99-109 [110-112] 113-127 [128-132] 133-193 [194-198] 199-211 [212-214] 215-225 [226-228] 229-235 [236-238] 239-275 [276-278] [Note: no even page numbers were printed]. [i]: blank. 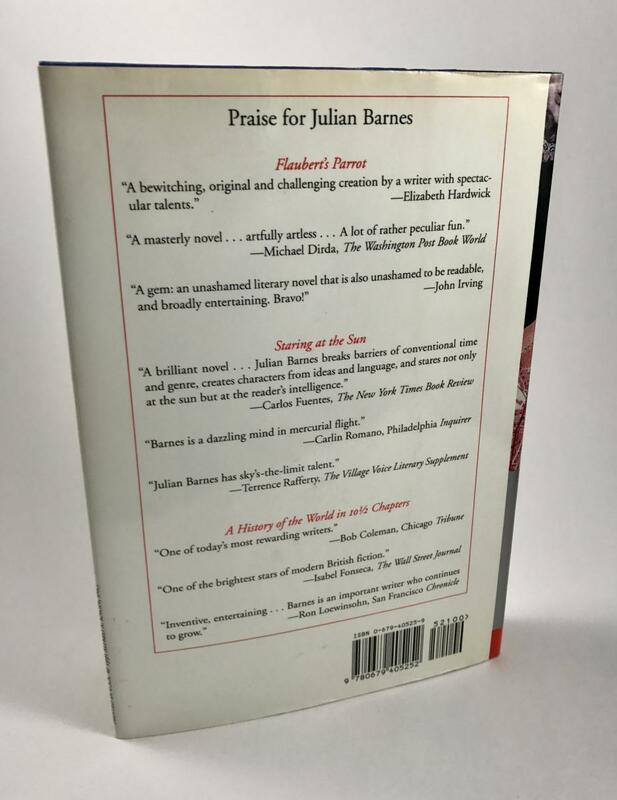 [ii]: ‘ALSO BY JULIAN BARNES | A History of the World in 10 1/2 Chapters | Staring at the Sun | Flaubert’s Parrot | Before She Met Me | Metroland’. 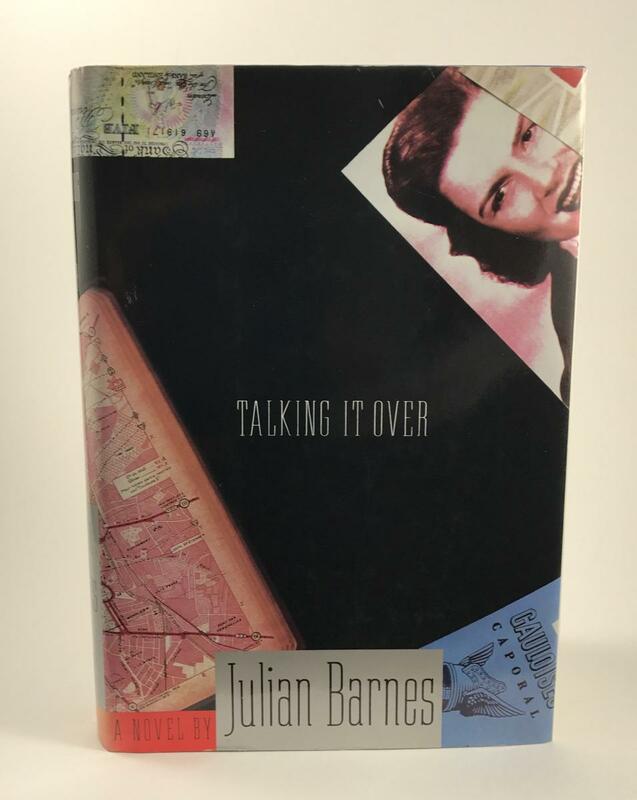 [iii]: ‘Talking It Over’. [iv]: blank. [v]: title page. 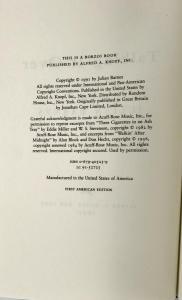 [vi]: copyright page. [vii]: ‘to Pat’. [viii]: blank. [ix]: ‘He lies like an eye-witness. | RUSSIAN SAYING’. [x]: blank. 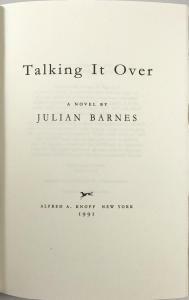 : ‘Talking It Over’. : blank. -275: text. [276-278]: blank. General description: Binding 22 x 15 cm. 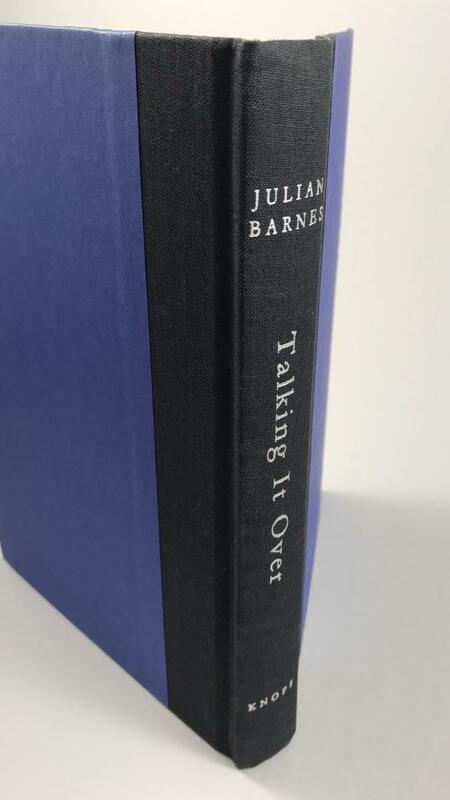 Blue boards, black quarter binding silver blocked on spine. Silver stamped initials ‘JB’ to lower front cover and embossed Knopf devise to lower back cover. 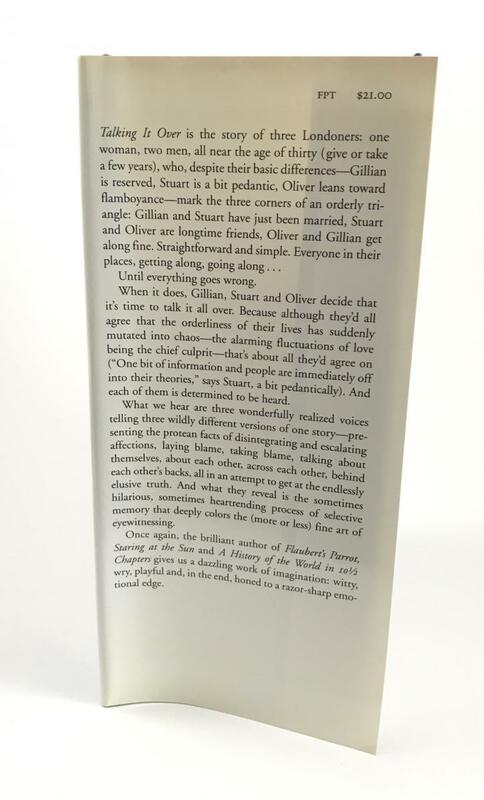 White endpapers. Dust jacket has black upper panel with multi-colored images of British currency, Patsy Cline, and map of Toulouse. 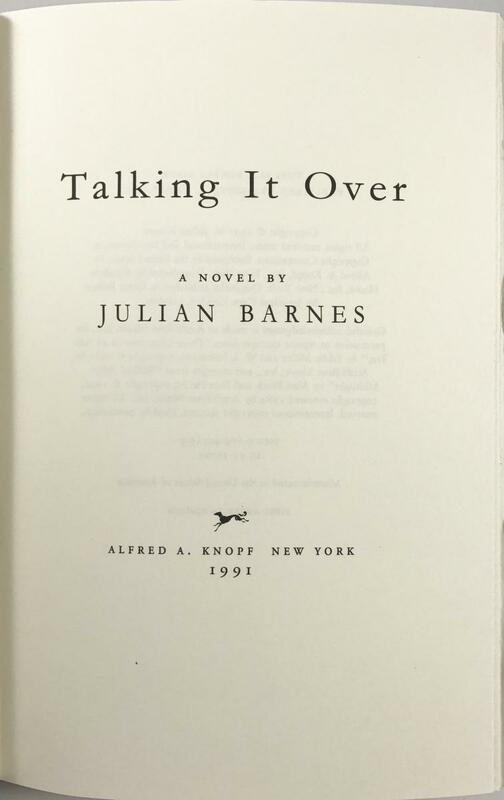 Lettering in white (title) and black (author), with author lettering inset in silver rectangle. 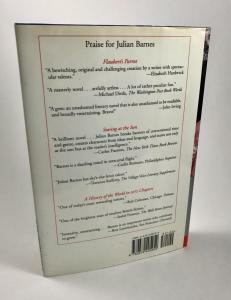 Lower panel and flaps are white with black lettering, except the titles of previous novels are in red italics. 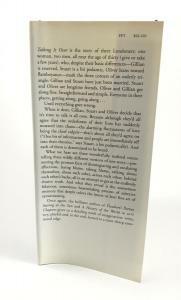 Jacket design by Carol Devine Carson. 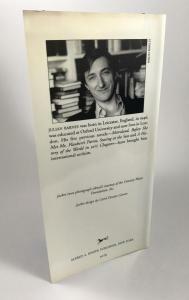 Photograph of the author by Miriam Berkley located on back flap.